An estimated 100 million people watch the NFL Super Bowl each winter. I'm one of them. In fact, I watch with great envy. That's because, in a country where we get what we celebrate, the impact of professional sports and events like the Super Bowl is clear. It is my dream that soon, some of the glory that other sports receive will be reflected toward robotics. I want kids to be as excited about science and technology as they are about running, jumping and kicking a ball. So I'm working on a movement to make robotics an official school sport, with opportunities for students to compete in competitions that rival Friday night football games in the way they are celebrated by the school and the community. I want students from every school in the United States to experience the excitement of solving real-world science, technology, engineering, and math (STEM) problems within the intensity of robotic sporting competitions, and to be recognized as heroes for their accomplishments - with pep rallies, trophy cases and varsity letters. This is a sure way to engage more students in STEM learning, creative problem solving and hands-on engineering experience that will propel them toward pathways to prosperity. The result will help close a gap wider than a football field in the need for STEM professionals compared to the amount of young people prepared to excel in those fields. STEM occupations are growing 1.7 times faster than non-STEM careers in the United States, according to the Office of Science and Technology Policy, yet not enough students are engaging in STEM. Some experts say this is an education problem, but I disagree. I think it's a culture problem. We honor entertainment figures and professional athletes as roles models and heroes. For example, Super Bowl quarterback Peyton Manning is hailed as a football hero with a contract worth $34 million. But in reality, very few student-athletes turn pro after college and join the NFL with this sort of multi-million dollar salary. According to the National Collegiate Athletic Association, of the eight million students who participate in high school athletics in the United States, less than 6 percent will compete at a collegiate level; of that group, only a fraction will realize their goals of becoming professional athletes. There's a better chance at winning the state lottery than becoming an NFL star. But what students can surely bank on is turning an interest in science and technology, through a sport like robotics, into a life-long career that creates personal wealth and economic growth. Baseball games are fun. Movies are entertaining. But they don't create long-term prosperity on a national, or international, level. Innovative discoveries do. Treatments and cures for diseases do. Finding solutions to the world's greatest problems - that's where young minds can truly affect the future. Celebrating science and technology the way we celebrate sports and entertainment will help accomplish this. 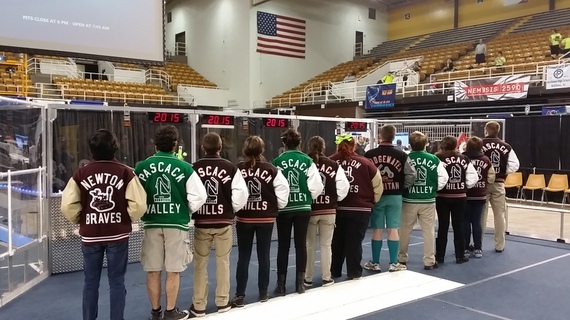 We can do this by creating a model for robotics that is embraced and supported like other school sports. This model can capture the hearts and passion of young innovators by challenging their minds, and help cultivate the next "Peyton Mannings" of STEM. We know it works. Studies show that when we implement this kind of sports model, kids are inspired to pursue STEM education and careers. In this effort, several states are working with school districts, legislators, state activities associations and corporations to sanction robotics as an official school sport. These programs allow afterschool robotics teams to become an important part of the school culture. Teams are honored at school events alongside soccer and football players, with support from school executives, teachers and community leaders; and the opportunity to earn varsity sports letters for high performance. In numerous schools, trophies for robotic victories are displayed in the schools' sports hall of fame. Texas is the latest state to make robotics an official school sport, offering millions of students access to hands-on robotics engineering challenges. This movement is quickly rolling across several states, including Connecticut and Minnesota, and is changing the collective cultural mindset of this country. As I always say, we get the best of what we celebrate, and our culture needs to start celebrating intelligence. When we do, we will reap the rewards - and so will future generations. Let's encourage kids to explore the fascinating world of science, technology, engineering, and math, and to pursue new innovations that will change the world we live in. Who wouldn't want to score that sort of touchdown? To join the movement, check out the site here. Dean Kamen is an inventor, entrepreneur and the founder of FIRST, For Inspiration and Recognition of Science and Technology, the not-for-profit that is spearheading the nationwide movement to make robotics an official school sport. Kamen is a tireless advocate for science and technology. He's determined to change the culture of the United States and to widen access to STEM by having a FIRST program available in every school in the country.